For many of us, the mirror is a clever ruse that hides the medicine cabinet. How many times have you tried to pull on a bathroom mirror in an unfamiliar home, expecting it to hide the Advil, only to find that it won't give - it's an actual mirror affixed to the wall! While concealing medications, Q-tips and toothpaste behind the mirror is a fine space-saving technique, it's not necessary in most bathrooms, and in fact, your space could be doing much more with its reflective surfaces. Whether that means expanding your vanity and lengthening your mirror to match or just going with a minimalist looking glass in a unique shape, why not think outside the box - or medicine cabinet, rather? Consider a few of these options. Try his and her vanitiesHis and hers vanities are about much more than a difference in taste. While he's welcome to decorate his space with his fantasy football stats and beard trimmer, the main advantage of his and hers vanities is to end the battle for the bathroom sink - and mirror! How often have you both been battling for space in the looking glass - he combing his hair, she applying last-minute eyeliner? Instead of doubling your mirror size, just double the mirrors themselves. Having two sinks is useful too - this way no one spits out toothpaste just as the other is going to rinse a brush. There's something luxurious about a wall-length mirror. Not only does it give you a better view, but it achieves that reflective magic of seeming to double your bathroom's space. If you're dealing with a somewhat cramped bathroom, this may be the perfect choice for you. But should you decide to go wall-length - or just larger - with your mirror, keep a few of these alignment rules in mind. You don't want to exceed the length of your bathroom vanity at any time. 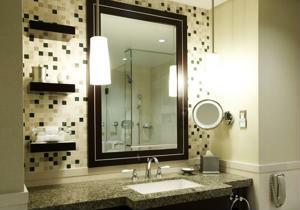 A mirror that oversteps the vanity in length will look sloppily placed and throw off the feel of your space. You also don't want a mirror to be too flush with the vanity counter or the ceiling, leaving a large gap near its top or bottom. Center your mirror between the ceiling and vanity for the ideal alignment that's also sure to give you the best view of yourself.